Human trafficking is not just something that happens in other countries. Neither is it something that just happens to “other people” such as runaways or the disenfranchised. Even kids in your own neighborhood can fall victim. But they don’t have to. 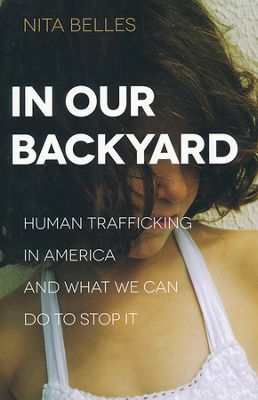 Through true stories and expertise from her many years of boots-on-the-ground experience, anti-trafficking expert Nita Belles teaches you everything you need to know about human trafficking in the United States, helping you identify risk factors, take practical steps to keep your loved ones and neighbors safe from predators, and recognize trafficking around you in order to help fight it. Nita Belles is an author, speaker, and anti-human trafficking crusader. She has worked in a broad scope of venues with law enforcement, government officials, social services, and the medical and faith communities to combat human trafficking. She is the managing director of In Our Backyard (www.InOurBackyard365.org) and regional director for Oregonians Against Trafficking Humans (www.cooath.org). The topic of human trafficking is one that is gaining press these days. Yet it’s still a topic that people don’t fully believe is happening today, at least not here in the U.S.A. In Our Backyard, Nita Belles will change that belief. Using true stories, she tells of modern day slavery in the form of human trafficking. It encompasses more than just young girls and it isn’t always of a sexual nature. Rather, human trafficking affects people of all races, ages and socioeconomic status. It is real, it is happening and there is something we can do about it. This isn’t an easy read and it’s not something you can read be unaffected. But it is an important book not only for the purposes of information, but for a move to a plan of action. Some of the actions we can take are as simple as watching who we are buying products from as many support trafficking predators in other countries, even while using Made in the USA on their tags. I highly recommend In Our Backyard. I received this book from Baker Publishing in exchange for my honest opinion which I’ve provided here.